Camp Runamuck: Well, That Wasn't Very Super! Well, That Wasn't Very Super! And so the football season ends for this New England fan. A field goal shy of a championship. If we had to lose, I'm glad it was to Denver, another of my favorite teams. They outplayed the Pats this year plain and simple. Peyton Manning has always been a class act, on and off the field. These old style QB's know a thing or two about modesty, humility and sportsmanship. A lesson some of the younger players would do well to learn. Congrats to Denver! I'll be rooting for you. While not super I did manage to get good and am going for better from those Tina Givens patterns. Yeah, I still did some more eye rolling and grumbling, but I liked some of the design features and was determined to make them work for me. I used some cute cotton I had gotten half price at FOV earmarked as working muslin fabric and I'm glad I did. The print is a bit young, but so sweet and the cool cotton works beautifully for warm weather wear around the house. I smile when I look at that King Bear and the little fairy girl. I did this as a pullover and loosely drafted the lower portion. It was a bugger lining up the lower pocket portion to the upper and next go round I'll do a tissue piece with actual marks so you can gather or pleat it correctly and evenly every time. This is a bit big so I'll be grading it down a tad. I rarely pre-wash my fabric. RTW stuff isn't and unless I think something is going to shrink excessively I put that buffer in at the cutting table. So far the sewing police have not arrived at my door and the truth is, I deal mostly with cotton and linen and they are pretty predictable. The next TG Peplone up will be from these two leftovers. A mid weight cotton canvas and about the same weight linen. 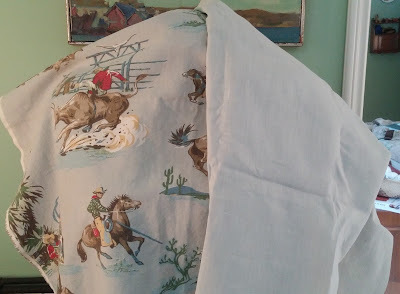 That cotton canvas western print has been in my stash for YEARS and its time has come! 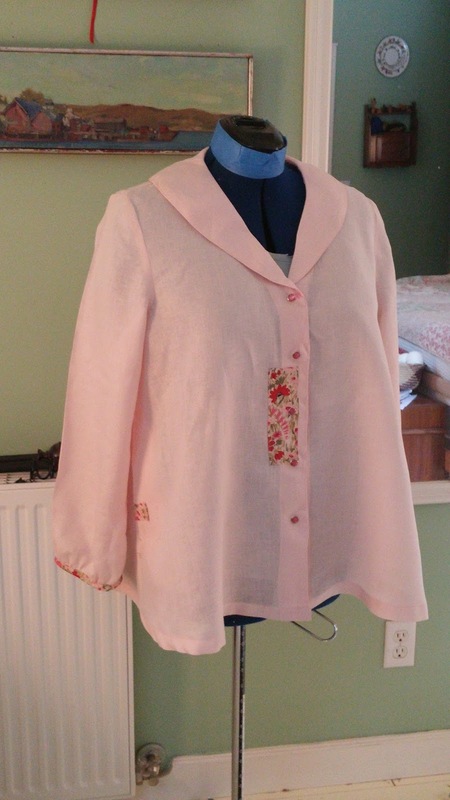 The second make last week was a Middy Blouse in a handkerchief petal pink linen. 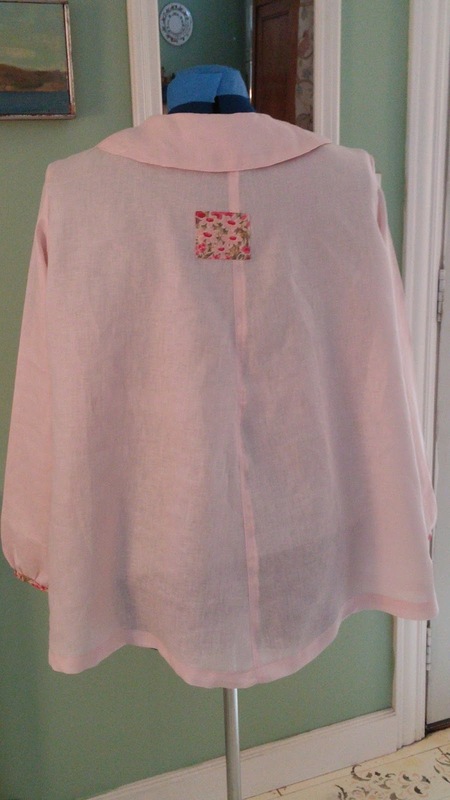 Girlie summer wear, it felt nice to work with this happy cool fabric while it was snowing outside last week. It will be doubly nice to pull this fresh from the closet on a hot spring day. The threading on Nick goes slowly. I am over half way through but not by much. It was a busy week. The little Gem has been emptied of his scarf/shawl warp though. I need to secure the edges and twist the fringe then give it a good soak to wet finish. I think it's going to be marvelous though. Pictures next post. Saturday friend Cindie and I finally got together. We'd been trying to line up our schedules for ages and weather and commitments kept getting in the way dang it! I drove over to Grants Pass, we did the Kitchen Company ( I spent more than I should have), and a couple of other places, had lunch, caught up and exchanged Christmas gifts. 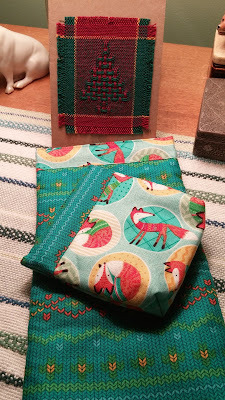 Cindie makes beautiful things and these bags are delightful (as is the lovely handwoven sample on her card). So cute and useful. The perfect gift. The top of the bag is held closed by using a tape measure. How clever is that? There is a 3rd larger bag, but I had already snagged it for a knitting project. 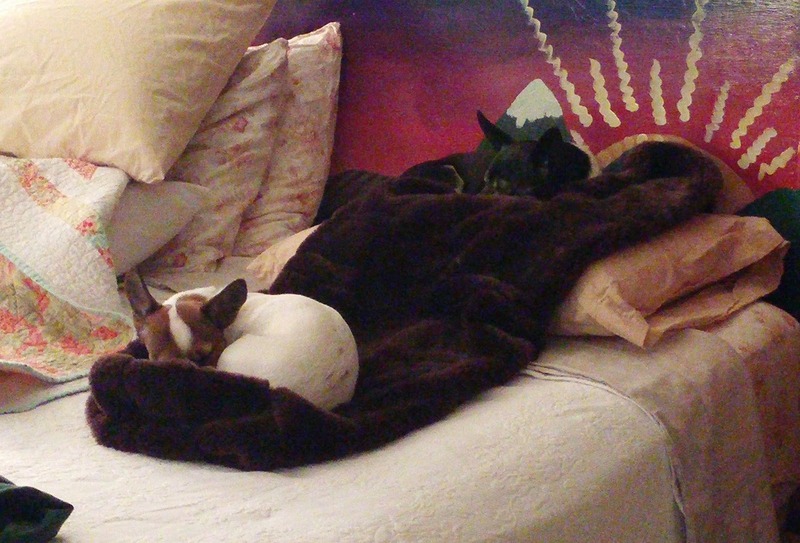 Look at those foxes. :-) But wait! There are more foxes!!!! 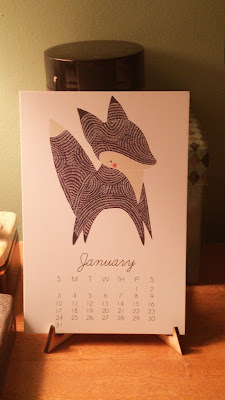 This cute calendar is on my dresser. At the end of the year I will find some small pretty frames and frame them all. I know just where to hang them all too. Thank Cindie, so much! Parting shot: Two to a bed please! Great stuff. I agree re. P.Manning. What a gent and, second, athlete. Love the middy blouse, perfect with lemonade on the back deck. 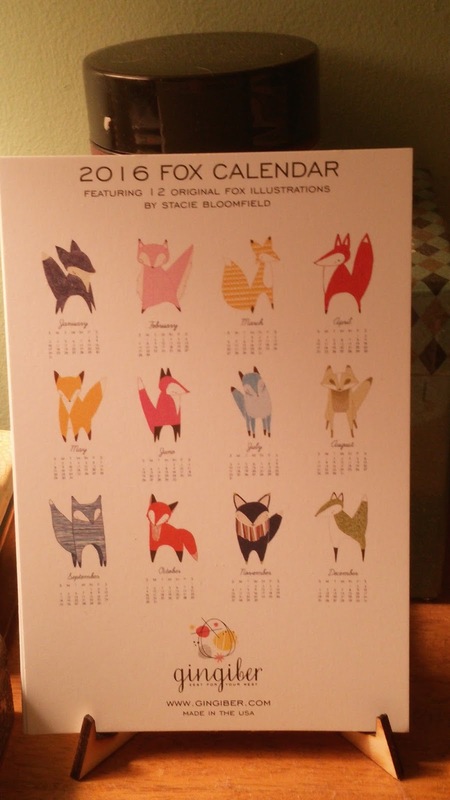 And the fox calendar is beautiful, the January print is stunning. If all months are in the same vein, I can see why you'd want to frame them. I also really like the middy blouse, even though I'm not generally a pink girl. What adorable foxes (and a thoughtful friend)! I like the pink blouse, too, a lot. 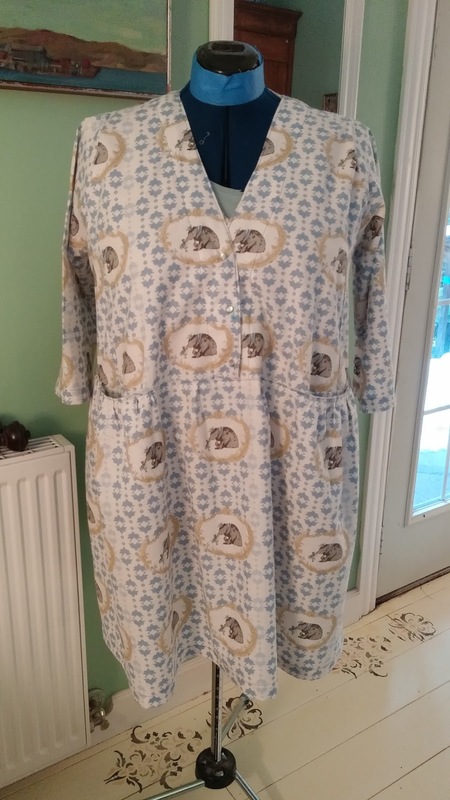 The sewing is wonderful and you'll have a full wardrobe before the snow melts. That foxy pattern just fits you! How wonderful to have a friend that knows you so well! LA, Cindie is a good friend and an all round amazing person. Susan, I hope he goes out on top. Frankly, I am glad the Pats have been spared what might be a complete blow out facing the Panthers this year. Michelle, I so rarely sew with anything pink, but it seems to be a favorite. I'm thinking of wearing it with some medium grey linen pants still waiting to be sewn. 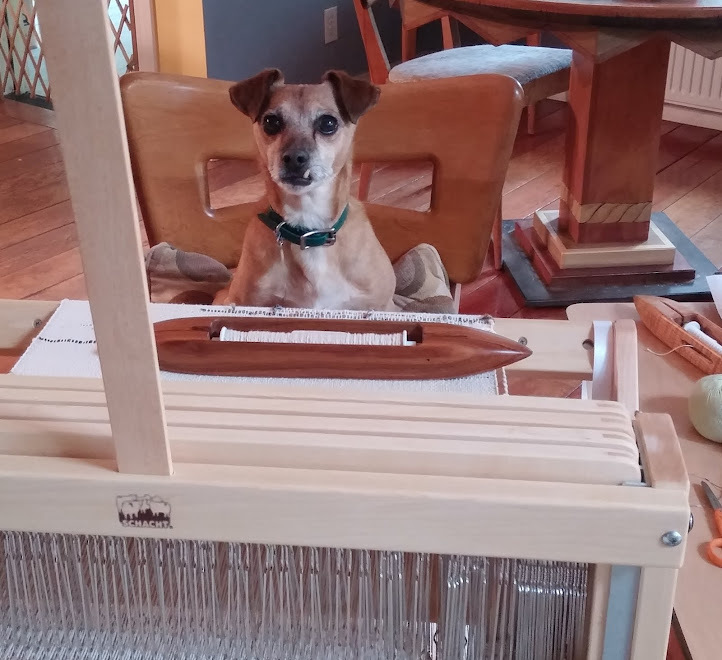 Peg, This linen was SO beautifully woven and gads such a smooth soft hand I couldn't pass it up no matter what the color. The pink is actually a bit softer in color than my monitor shows, a very pale shell pink. Coco, That calendar is the bee's knees! And such a clever idea. It came with its own little heavy cardboard stand. Awesome!